It may not be the most important thing, and it cannot be the only thing, but laughter is at the top of qualities I love in a person. The only thing better than laughing is shared laughter—hard laughter! The kind where something sets you both off at the same time, and you can keep it going—through words or a glance—longer than normal. Better yet, longer than appropriate! Best of all, long enough to get you in trouble! I can name them—my oldest friends, my best friends, my mother, son and brother—all people who made or still easily make me laugh. Those I can count on to share a laugh in the darkest of times. I love it when one of my patients and I share a sense of humor, because laughter is healing. And if there can be both tears and laughter in a session, so much the better! First of all, why the “one thing” limit? Is it assumed that without a limit I would drone on and on in a vacation slide-show monologue forcing polite nods and smiles from people who secretly wanted to hang themselves? I probably would! Tanya and I have always had laughter. My first vivid recollection of our laughing hysterically together was in the PX at Redstone Arsenal Army Base in Huntsville, Alabama. I was 17 and she was 18. We were in the greeting card section, selecting funny cards and reading them aloud to each other. After awhile, the cards didn’t even have to be that funny. Sympathy cards had the same result. Life has dealt us both some devastating blows and our ability to connect and laugh through them all has served us well—even when our laughter has a maniacal quality—especially then. Our trip to Paris came at a perfect time for both of us. I have been dealing (gratefully!) with the prolonged stress of birthing my book, and Tanya has been dealing with the rapid deterioration and ill health of both her parents. Her mother died five days before our scheduled departure. After careful consideration, Tanya decided to take the trip. We’ve both lived long enough to know that time is precious and if not now the when might never come. And, so, early on October 31st, we landed in Paris. I won’t detail all the times we laughed or I will sound like that dreaded vacation slide-show. And I’ve found that most of the stories are better as spoken word, or turned out to be “you had to be there” funny. So I won’t write about being offered massages by a random French guy on a plaza—or the scary Madame who swirled her finger around in our goblet of chocolate mousse, tasted it, and proclaimed, “It is fine!” when Tanya and I refused to eat our (yucky) dessert. I will tell you about our apartment. When planning the trip to Paris, I was determined that we would stay on the ancient and picturesque Ile St. Louis, one of two islands located in the middle of the Seine where buildings originated in the 17th and 18th centuries. After obsessively searching possibilities that didn’t cost a zillion euros, I found “Your Charming Little Flat on Ile St. Louis.” If you check the link you’ll see the pictures are beautiful and the reviews mostly great—“location, location, location” being the common theme—along with mentions of low-hanging concrete beams threatening serious head injury to anyone over 5’ tall. Everything else sounded so perfect, that I booked the flat then pondered the problem of the low beams. Balloons! I thought. 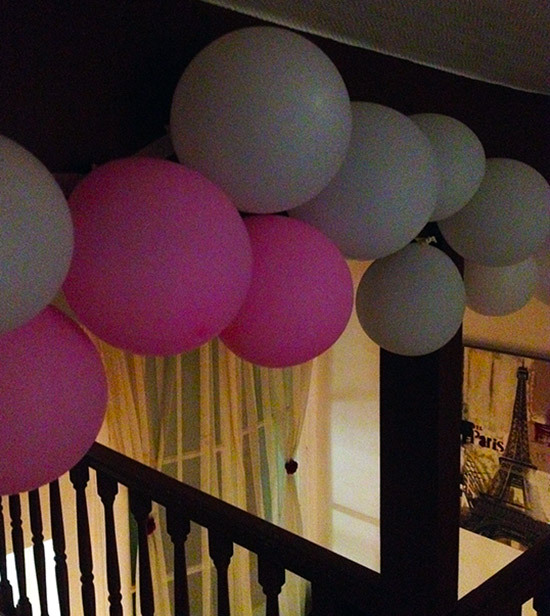 And so, we took packages of bright pink and white balloons and a roll of masking tape with us to Paris. After riding the RER train from the airport to the St. Michel stop on Ile de la Cité, we emerged into the beautiful crisp autumn morning directly across from Notre Dame Cathedral. It was breathtaking! Wearing backpacks and pulling rolling suitcases, we walked past Notre Dame and across a bridge to Ile St. Louis. We continued down a street filled with boutiques, restaurants, bakeries, cheese shops, and art galleries until (after 19 blocks!) we reached 20 rue-Saint-Louis-en-I’île—an imposing five-story stone building with an enormous wooden door. Very French! After Adriana left, Tanya and I collapsed on the sofa, looked around, and laughed. We were glad we had brought balloons. The description “charming” was a euphemism for creatively photographed, and “little” a euphemism for “perfect size for Quasimodo (the hunchback of Notre Dame).” At 5’9” my head touched the ceiling if I stood erect on the loft level. I couldn’t use the shower without kneeling in the tub, and I would have killed myself walking in or out of the bathroom had I not remembered to duck. Before even unpacking, Tanya and I blew up balloons and taped them to beams above the loft bedroom and the entry into the bathroom. After an hour, the beams were no longer as treacherous. Over the six days we were in Paris, the balloons gave the apartment a festive je ne sais qoi, and eventually we lost count of how many head injuries we were spared as one or the other of us banged our heads into the squeaky rubbery life savers— usually in the middle of the night—always to laughter! Our pink and white balloons literally saved our heads and left us with unwarranted fondness for our “Charming Little Flat on Ile St. Louis.” They will forever be woven into the tapestry of our friendship—bright little memories of yet another time we created laughter from what might have been disaster. We also have memories of laughing while watching street performers wrestling beneath a sheet. And fifteen minutes of hard laughter we feared would get us kicked out of a quiet restaurant—while a woman looked on from another table wishing she had what we were having! And laughing while huddled with a hundred other tourists—caught in a torrential rain storm during a boat ride on the Seine. Near the end of our stay the balloons began to shrivel into sadly funny wrinkled little pouches. We were tempted to leave them behind as a gentle suggestion to our landlord, but feared we’d incur additional charges. At the very last minute we stripped them down, tossed the giant skeleton key onto the table, and—after one final laugh in our charming little flat—we closed the door behind us. Laughing my head off reading this post in the Barnes and Noble café… my writing partner and I are thrilled to know of a place for short people… but she just said her new goal is to bump her head on balloons in an apartment in Paris… thanks for the great laugh! Thanks so much for reading and commenting. I’m glad I made you and your writing partner laugh! Wow, I never thought of my post as a “trip advisor” for short people! The landlord should take note and put a positive spin on the whole low beams thing. Tell your friend to follow the link to the Charming Little Flat in Paris, and reaching her goal is just a click away…but she must bring her own balloons!!! The visual is hysterically funny! How witty to bring the balloons and how awful not to have had anything could have been. Love love the description of …squeaky rubbery lifesavers …oh how how glad you were to feel them I am sure! Thank you for sharing the laughs! Thanks so much for reading and commenting! I left out the fact that many times the FIRST response to hitting the balloons in the middle of the night was a loud expletive, but laughter always followed. Glad you liked the post…and so happy it made you laugh. Laughter IS the best thing, isn’t it?! Wonderful, witty, and so eloquently you paint the picture …and yes, I laughed out loud. What a special gift in life your friend is. Thanks for sharing. Thank you so much for reading and commenting…and for the beautiful words! So happy I made you laugh! Tanya is one of the most precious gifts in my life…and sharing our story makes our laughter the gift that keeps on giving!! !